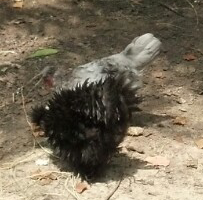 One of our most famous chickens is Frizz – a Cochin bantam who looks like she stuck her beak in a light socket. She is a small bird who makes up for her size with attitude. She and Samson, a bantam rooster who has feathered feet, have lived with the big birds for quite some time. This spring, we moved them into the bantam side. We then incubated Frizz’s eggs in hopes of duplicating her unique look. Frizz the Second is a bit more timid than her mother, but then she is still young. We have several friends who are now keeping chickens. One has asked about purchasing bantams from us. Rachel was willing to let Frizz the Second go. I am not. So we are hatching more eggs. We’ll see what comes out.